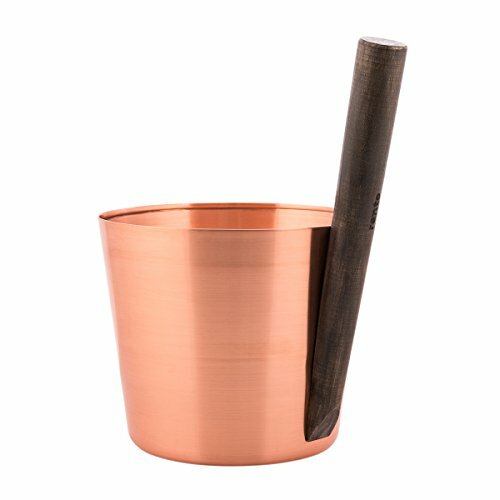 Find the perfect marriage of natural and industrial on the Rento Copper & Beech Wood Sauna Bucket. Designed to coordinate with the Rento Copper & Beech Wood Sauna Ladle the blend of the dark-stained beech wood and red glowing copper allows this piece to fit in traditional or more modern style saunas. These materials are also eco-friendly so youll have a feel-good sauna experience in more ways than one. Easily picked up by sturdy stick handle to fill with up to 5 liters of water this bucket is both a functional furnishing and beautiful accent. Holds: 5 Liters Please Note: We are sorry, but we are not able to gift wrap this item. Care: Clean with mild, soapy water, using a soft sponge or brush. If you have any questions about this product by Rento Sauna, contact us by completing and submitting the form below. If you are looking for a specif part number, please include it with your message.